what in the world does rockstar mindset do? Hi, I'm Draven Grey, founder of Rockstar Mindset, and I would like to show you...how do you build a successful career for your band in todays music industry? Sure, you can look to your favorite bands, but don't you really want to know what goes on behind the scenes that makes them successful? Not many bands are very vocal about what it takes for them to be successful. They rarely talk about their struggles and what their keys to success are. But who am I to tell you the "secrets" of success in music? After being in a band just like yours that spent years climbing to the top; after years of playing bars, small venues, and grabbing for radio spots, finally playing with huge names, having crowds over ten thousand strong, and being under great management; only to walk away from a sour record deal and find myself back at the bottom again, I was tired of the hype. I was skeptical of everyone offering a "quick and easy" way to fame. And at the same time, not wanting to go through all the struggle and crap again, I took a step back and said, "There has to be a better way than this." I spent too many years following what I thought was the example of my favorite artists and getting nowhere. What I couldn't see was what really went on behind the scenes. So, I surrounded myself with music industry executives, started interviewing some of my favorite artists and managers, started grabbing every bit of information I could about how incredibly successful bands created their career, and determined to learn how the most successful bands make it happen. The good news is, there is definitely a better way than playing one bar after another, hoping to one day be rescued from mediocrity by the super-human record label guy. This better way is often hidden behind closed doors, kept top secret by the industry executives who have used it time and time again to create the mega-stars we’ve grown to love, or covered up by a band’s public image and media that’s more interested in pleasing music fans than helping you learn about how your favorite bands climbed their way to the top and continue to stay there. Let's face it, most bands don't make it. The challenges and obstacles are too many, too big. Your plan for success seems to be falling short. How are you going to sell at least 10,000 records so that a record label will even consider you? How will you get out of playing bars and get real, paying gigs? How are you getting more people to your shows? What is your plan for recording, touring, and making a living off of your music? Aren't you sick of the struggle? Most bands don't have a plan; they give up, or worse...settle. But you are not most bands. You take action and take control of your career. And we are here to help you make your blood, sweat, and tears count. Get unstuck and achieve real results. Become incredibly successful with or without a record deal. We're not going to say "we are the perfect guide for you", because that would be cliché. In fact, we would not advise you to choose to work with us until you're fully confident that we provide you with exactly what you need. If you haven't already, sign up to our [mailing list] and experience a small taste of what we have to offer you. Surround yourself with those that know how to maximize your potential and give you a real chance at breaking into the music industry. 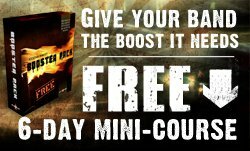 This band Booster Pack, FREE when you sign up now, will give your band the extra boost you've been waiting for by walking you through the most important things you need to get more shows, make more money, gain even more fans, help you turn those fans into fanatics, AND make you much more attractive to gatekeepers. Multiple one-on-one sessions monthly including premium support, personalized resources, and tailored assignments designed to give your band massive results. Single, private sessions with us that focus on any urgent or pressing needs your band might have. Not sure which program is right for you? [Contact us] and we’ll help you find the option best for you. And remember to sign up to our [mailing list] for even more amazing resources! * Skype, email, or phone consultations available. "Rockstar Mindset really surprised us. Not only did we find an immense renaissance of knowledge about the music industry, we also had a newfound work ethic and a whole new level of confidence in ourselves. We feel amazing, and unstoppable! Rockstar Mindset provides personally tailored guidance in an otherwise chaotic industry."